An Giang Province has ambitious plans to develop shark catfish farming in the next few years. – VNA/VNS Photo Văn Trí. 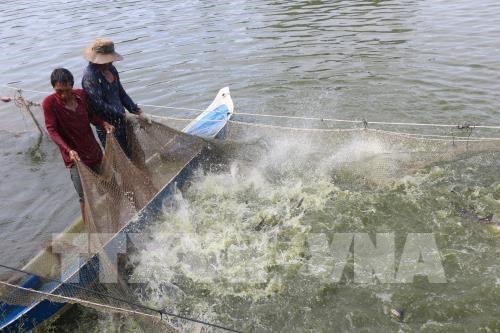 AN GIANG — Shark catfish farming has grown rapidly in An Giang Province due to the authorities’ efforts to introduce sophisticated farming techniques and new technologies. The fish is farmed on around 741 hectares of ponds, 11.2 per cent higher than a year ago, with output in the first half of this year being 16.4 per cent higher at 167,000 tonnes. With demand for shark catfish being large, prices have ruled consistently high at VNĐ29,000-31,000 (US$1.26 – 1.34) per kilogramme, fetching farmers an income of VNĐ9,000 per kilogramme. According to the provincial Department of Industry and Trade, 58,920 tonnes of the fish have been exported this year for US$139.5 million, a 22.3 per cent rise. The exports went to 72 countries. Demand for juvenile catfish for farming has also increased, and over 1.2 billion juvenile fish were bred for the purpose this year, 7.5 per cent higher than last year. The provincial Department of Agriculture and Rural Development has been helping farmers learn proper farming methods and testing water quality at farms to ensure they are optimal for raising the fish. It is also working with farmers and businesses to plan breeding and harvesting activities.